In 1874 Macmillan & Col published a leather=bound set of memoirs on Holland House. 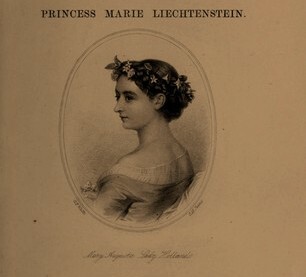 The author was the Princess Marie Leichtenstein. “As it was, we must think its publication a mistake….It is impossible to say what is the central figure in it. Holland House, Charles James Fox, the mutability of human fortune, Napoleon’s snuff-box, or the knights who dined round Holland House’s table.”–The North American Review, 1874Well, what can you expect from an American critic?Her Highness was brought up in Holland House when the 4th Baron Holland and his wife, Lady Mary Coventry, were in residence. Lord Holland was the last of his line and the couple had no children. They adopted a little girl and she was christened Marie “Mary” Henriette Adelaide Fox. She was thought to be Lord Holland’s illegitimate daughter by another woman, but this circumstance seems to have posed no impediment. After all, she married a prince. Oh! What an odious thing to say. We are lucky even princesses were moved to record the past. Places like Holland House tended to be done away with in rapidly developing, expanding London. And the old house had reason to tremble at the time of its biography. Great Northumberland House was being pulled down and there was movement afoot to do the same in Kensington where this rival to Lansdowne House still remained. This entry was posted in Regency, Uncategorized and tagged 4th Baron Holland, Holland House, John Whishaw, Lady Mary Coventry, Madame de Stael, Princess Marie Lichtenstein, Talleyrand by Angelyn. Bookmark the permalink. Angelyn, what a great find. Lovely post. How fun to have found this! I do so love the Abraham Hayward quote. Is it possible to be odious and amusing at the same time? Thanks again, Angelyn. I have the two-volumns on Holland House written by the Earl of Ilchester; didn’t know about the princess’s. Hmmmm. I may need to track one down. There were so many sources on Holland House, it was hard to choose which ones to use. I’m glad you mentioned that one. I’ll have to check it out. Thanks for stopping by, Cheryl. There happens to be a 2-volume set of Hollan House up on eBay. I swear I have no connection with the auction and I assume that HH is available in ebook form from someone but I thought your audience might be interested. Thanks for letting us know, Duncan. That would be an important resource to consider purchasing.